"I Am Not Your Toy"
This picture doesn't exactly lead us to make cute little baby noises. Sorry, back to the point. 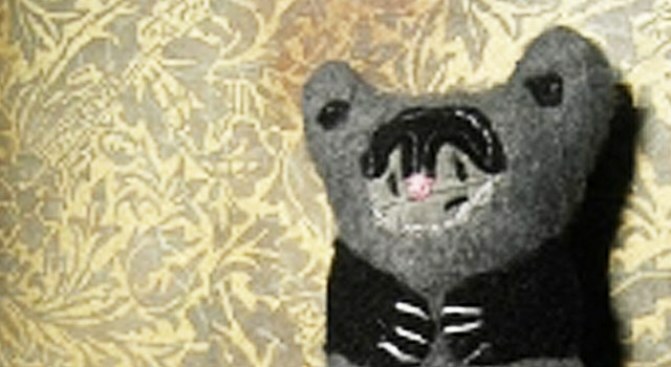 Artists from around the world have submitted their various stuffed and plush creations to be displayed at Mortal Plush through Aug. 7. Now don't expect to see the likes of Zeebie (your childhood stuffed zebra -- yes, we know ALL about that) or your kid sister's Build-A-Bear. The frozen expressions on the faces of these original and homemade soft sculptures will supposedly mimic those experienced by their human creator. Kinda creepy, if you ask us. Then again, we kinda like creepy. Anyone interested can check out the free exhibit every day from 6 p.m.-midnight at the National Harbor's Art Whino Gallery (173 Waterfront St., National Harbor, Md.). DJ Fleg will be spinning tunes to go along with your stuffed friends.